Tyrone manager Mickey Harte has made four changes for Saturday's Division Two Ulster derby clash with relegation-threatened Armagh at Healy Park. Niall Morgan returns in goal in place of Mickey O'Neill, while there's a first league start for Padraig Hampsey, who replaces full-back Ronan McNamee, who has an ankle injury. Rory Brennan comes into the half back line in place of Johnny Munroe. In attack, Darren McCurry is recalled at the expense of Conal McCann. Ronan O'Neill has recovered from a back injury he picked up late in the win over Meath, and starts at centre forward, but his Omagh clubmate Conor Meyler will play no part, due to a hamstring injury sustained in the same game. The Orchard men desperately need a win to lift them out of the danger zone while Tyrone have already secured promotion back to Division One after winning each of their five matches to date. Armagh boss Kieran McGeeney makes three changes from the draw with Galway as Ciaran McKeever is handed his first start of 2016. McKeever, who came on as a substitute against the Tribesmen, replaces Sean Connell while other changes see Andy Mallon and Aaron Findon taking over from Joe McIlroy and Brendan Donaghy. Heading into the penultimate series of games, Armagh are currently bottom of the table on three points, with Laois and Meath also on the same points tally. 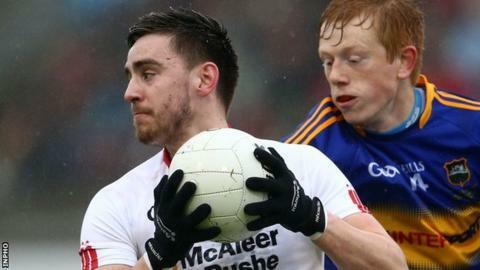 Derry are also not out of the relegation woods and they face a vital home game against Meath on Sunday. Damian Barton has named the same team which started in the high-scoring draw against Laois two weeks ago. Fermanagh will hope to ease their relegation concerns by earning an away win in Galway on Sunday. Ryan McCluskey is handed his first start of the season while Sean Quigley returns at full-forward after only being named as a sub for the defeat by Cavan. With Richard O'Callaghan unavailable because of injury, Damian Kelly is drafted into the Erne midfield. Galway currently share second spot on six points alongside Cavan and the Breffnimen will be fancied to maintain their promotion push by beating Laois at Breffni Park on Sunday. In Division One, Monaghan manager Malachy O'Rourke has made two changes from the disappointing defeat in Cork with Thomas Kerr and Daniel McKenna taking over from Gavin Doogan and Conor McCarthy. After two opening wins, Monaghan have lost their last three games and another defeat in Clones would leave the Farney men in relegation trouble heading into their concluding games against Donegal. Down's relegation from Division One will be confirmed if they fail to beat Cork in Pairc Ui Rinn on Sunday. The Mourne County have lost all five of their games and their scoring difference is vastly inferior to the other teams in the relegation zone, Mayo, Cork and Monaghan. Game of the weekend looks to be Saturday evening's Division One clash at Croke Park as All-Ireland champions Dublin face Donegal. The Dubs are already guaranteed a semi-finals spot after five opening wins but Donegal are aiming to avoid a third successive defeat after losses against Kerry and Roscommon. In Division Four, Antrim, after their five opening wins, will be guaranteed promotion if they defeat Wicklow in Aughrim. Tyrone: N Morgan, A McCrory, P Hampsey, C McCarron, N Sludden, R Brennan, T McCann, C Cavanagh, M Donnelly, P Harte, R O'Neill, R Donnelly, D McCurry, S Cavanagh, C McAliskey. Armagh: P Morrison; A Mallon, C Vernon, S Heffron; M Shields, C McKeever, A Forker; A Findon, E Rafferty; R Grugan, M McKenna, C O'Hanlon; C Watters, S Campbell, G McParland. Derry: T Mallon; O Duffy, C McKaigue, K McKaigue; G McKinless, B Rogers, D Heavron; N Holly, Emmet Bradley; R Bell, C Bradley, B Heron; S Heavron, E McGuckin, SL McGoldrick. Fermanagh: C Snow; M Jones, C Cullen, N Cassidy; J McMahon, R McCluskey, A Breen; E Donnelly, D Kelly; B Mulrone, R Lyons, R Jones; R Corrigan, Sean Quigley, T Corrigan. Monaghan: R Beggan; C Walshe, D Wylie, R Wylie; D Mone, F Kelly, K O'Connell; N McAdam, D Hughes; S Carey, D Malone, T Kerr; R McAnespie, D McKenna, C McManus.